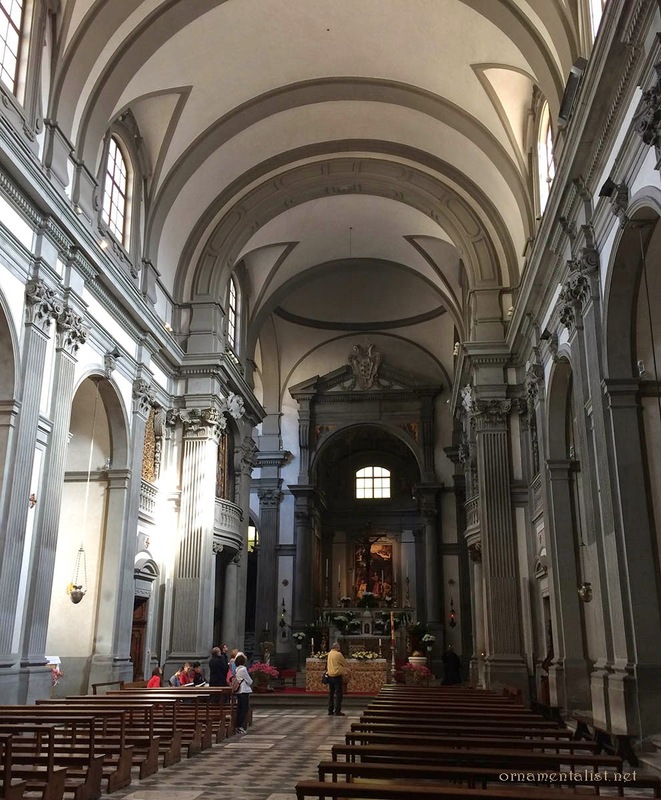 All around Florence are beautiful examples of simple, austere architecture, a good many of them designed by Brunelleschi such as the Ospedale degli Innocenti, and the churches Santo Spirito and San Lorenzo. The look is created with simple plaster walls supported by columns and mouldings of pietra serena, the native sandstone, and of course, excellent proportions. Despite being crammed with colorful art (generally added later) most of the Renaissance interiors in Florence retain a calm environment and a cool serenity that begs you to listen, wait, breathe. It's a formula that works as well in later architecture, and I think it's the defining architectural style of Florence, even today. 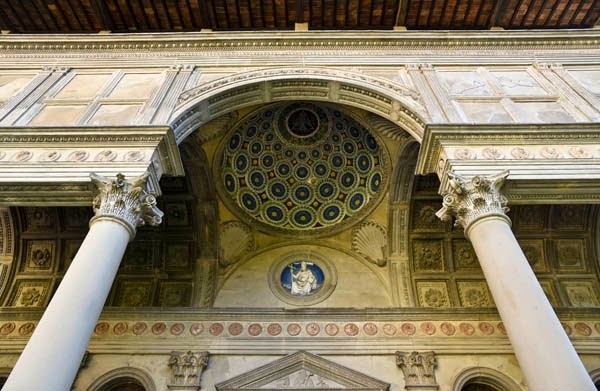 The most notable example of this austere architecture I can find is the Pazzi Chapel, (if not designed then certainly influenced) by Brunelleschi, completed in 1460 in the first cloister of the Basilica of Santa Croce. It is simply the most composed, serene, purest example of Renaissance architecture in Florence. It speaks directly to the desire for simplicity, and peace, and all sorts of ideals about geometry, order, and being bigger than the sum of one's parts. I was floored by this breathtaking space the first time I set foot in it (in 1980, under the guidance of my mentor Dr. Otto Mower) and regularly return when in Florence for a dose of mind-clearing symmetry. Altar, Pazzi Chapel, Santa Croce. Where's that light coming from? These last two photos were taken in February while I hovered in and around Sta Croce during a lighting storm, awaiting word of my father's condition after he had emergency surgery thousands of miles away. I could think of no better place to keep it together. I got the message, don't go to pieces, it's not all up to you. 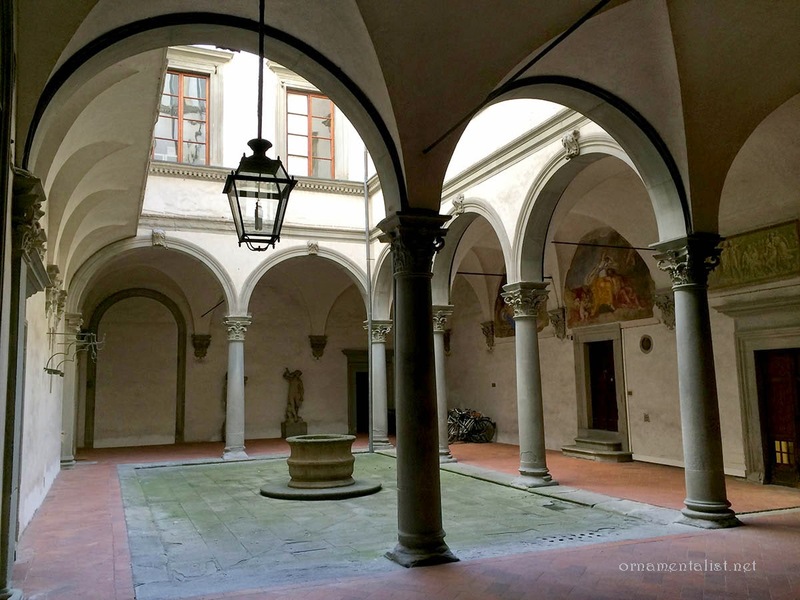 Opera di Santa Croce Firenze, the non-profit institution that operates and maintains the Franciscan church has announced a crowd-funding campaign to restore the loggia that forms the entrance to the Pazzi Chapel. This 15th century loggia is an important document in Florence's architectural history, a sampler of every Renaissance feature you can shake a stick at: a cupoletta by Luca della Robbia; lacunaria with carved rosettes; a terra cotta frieze border of cherubs; classic columns; borders of dentils, guilloche, acanthus, egg and dart, and basically the whole nine yards. Austere? Serene? Non c'è modo! More of a celebration of everything going on at the time. More is more! These details are now literally falling apart and require immediate attention. 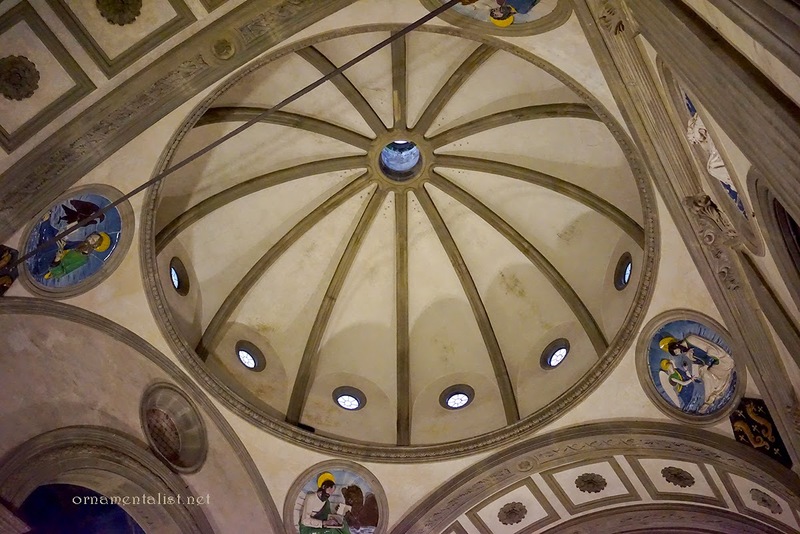 - Read more about the Pazzi Chapel and the restoration efforts at the fabulous ArtTrav blog. - Donate to the only Kickstarter campaign ever to be launched by a 720 year old church! UPDATE: FUNDED! Thank you! to any of my readers who contributed! Many of these architectural terms are in the Glossary! Great post! Thanks so much for your support of the #CrazyForPazzi campaign. We hope you'll join in at tonight's Twitter chat! 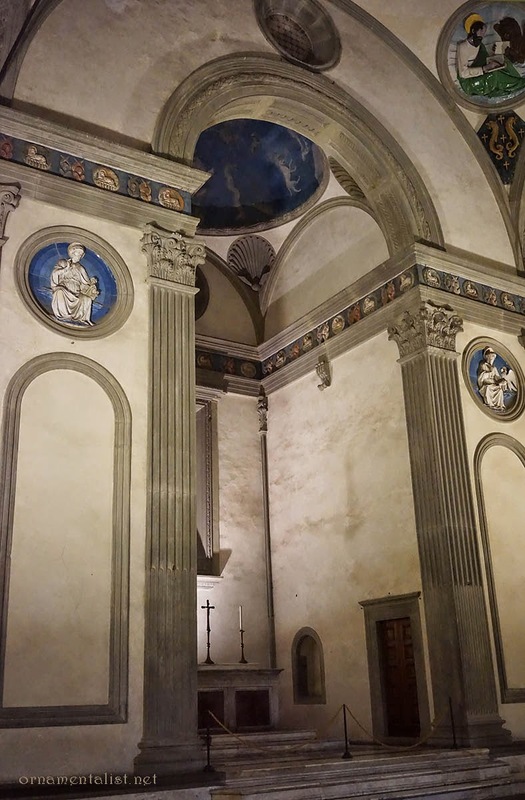 Another space in Florence that has this same feel of purity is Michelangelo's New Sacristy. Frankly, I'm very torn between "less is more" and "more is more." Maybe it's the Gemini in me, but some days I go for the Medici palace, and some days I go for the Buddhist temple!